This Expert Advisor is designed to manage orders. Set a stop loss for an order having none. Set a take profit for an order having none. Close the last order if the total orders of a symbol are over the setting. Close the order if its lots are over the setting. Close the order if its profit in pips is over the setting. Close the order if its loss in pips is over the setting. Close the order if its profit in amount is over the setting. Close the order if its loss in amount is over the setting. Close all orders of a symbol if the total profit of the symbol is over the setting. Close all orders of a symbol if the total loss of the symbol is over the setting. Set a breakeven for an order if its profit in pips is over the setting. Set a breakeven for an order if the ratio of the floating profit and the stop loss is over the settings. The order should have a stop loss. Close all orders of the account if the total profit of all symbols is over the setting. Close all orders of the account if the total loss of all symbols is over the setting. Close an order if the symbol of the order is not in the list of the allowed symbols. Close an order if the symbol of the order is in the list of not allowed symbols. Note: All the settings should be positive numbers, otherwise the corresponding function will not work. StopLossPipsFX:	Set a stop loss for an order having none. TakeProfitPipsFX: Set a take profit for an order having none. 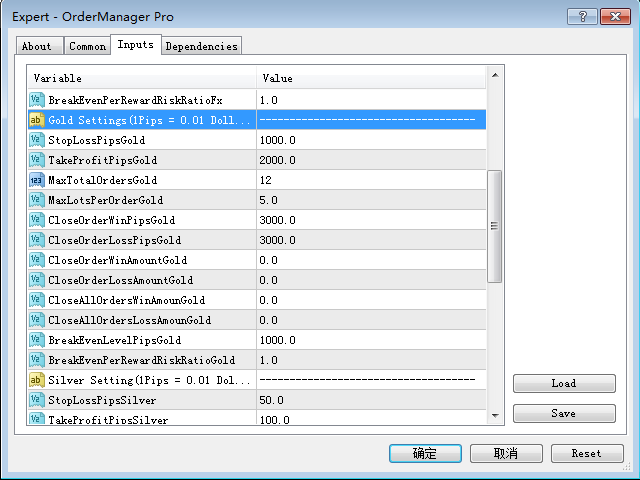 MaxTotalOrdersPerSymFX: Close the last order if the total orders of a symbol are over the setting. MaxLotsPerOrderFX: Close the order if its lots are over the setting. CloseOrderWinPipsFX: Close the order if its profit in pips is over the setting. CloseOrderLossPipsFX: Close the order if its loss in pips is over the setting. CloseOrderWinAmountFX: Close the order if its profit in amount is over the setting. CloseOrderLossAmountFX: Close the order if its loss in amount is over the setting. CloseAllOrdersWinAmountPerSymFX: Close all orders of a symbol if the total profit of the symbol is over the setting. CloseAllOrdersLossAmountPerSymFX: Close all orders of a symbol if the total profit of the symbol is over the setting. BreakEvenLevelPipsFX: Set a breakeven for an order if its profit in pips is over the setting. BreakEvenPerRewardRiskRatioFx: Set a breakeven for an order if the ratio of reward and risk is over the setting. Settings for Gold (XAUUSD) orders: Similar as Setting for forex orders. 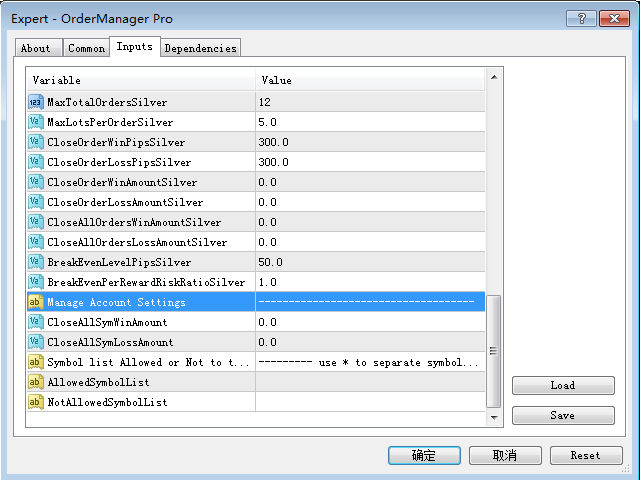 Settings for Silver (XAGUSD) orders: Similar as Setting for forex orders. CloseAllSymWinAmount: Close all orders of the account if the total profit of all symbols is over the setting. CloseAllSymLossAmount: Close all orders of the account if the total loss of all symbols is over the setting. 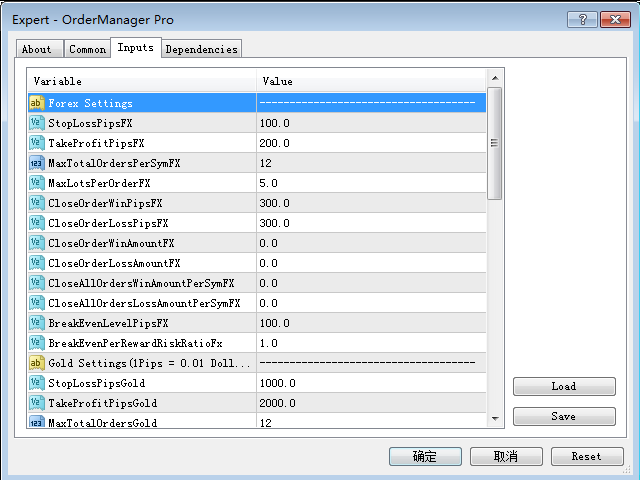 Settings for the symbol list allowed or not to trade, use * to separate symbols. AllowedSymbolList: Close an order if the symbol of the order is NOT in the list, for example, EURUSD*GBPUSD*USDJPY. In this case, you can trade only these three symbols, otherwise the order is closed. NotAllowedSymbolList: Close an order if the symbol of the order is in the list, for example EURJPY*GBPJPY. In this case, you cannot trade these two symbols, otherwise the order is closed. If you do not set the list, there is no limitation. Working great for me so far, will update again in a week. 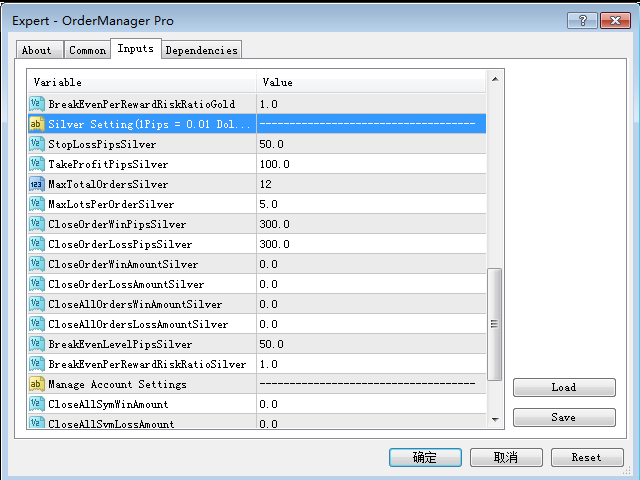 V8.5 EA can mamage 61 forex symbols and 4 metals(Gold and Silver). Fixed bug --- EA recognizes XAUUSD as forex in some brokers such as ICMarkets,New v8.4 fixed this bug.